Employment growth means there are more buyers (especially first-time buyers) ready to take the plunge. However, seller traffic isn't nearly keeping up with buyer demand in most states. Seller traffic is higher where employment has contracted. 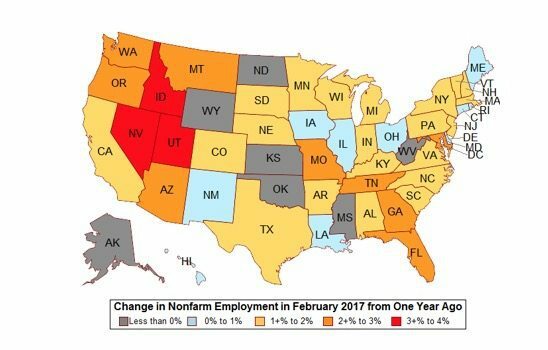 In Nevada, Idaho and Utah in March, companies were hiring and people were finding jobs; non-farm employment was 3 percentage points to 4 percentage points higher this year than in 2016. So it’s no shock that those states were all in the “strong” or “very strong” buyer traffic sections of the National Association of Realtors’ (NAR’s) latest Realtors Confidence Index report, which surveys 50,000 Realtors every month; 2,703 Realtors responded to March’s survey, and 1,484 of those respondents had closed a sale. And it’s likely no surprise that those Realtors said the biggest challenge they faced in March was — wait for it — a lack of homes for sale. In March, 32 percent of homebuyers were first-time homebuyers, according to NAR. “Amid sustained job creation, the share of first-time homebuyers has been on a modest rise, up from 29 percent in 2014,” the report stated. Nonfarm employment growth from March 2016 to 2017. 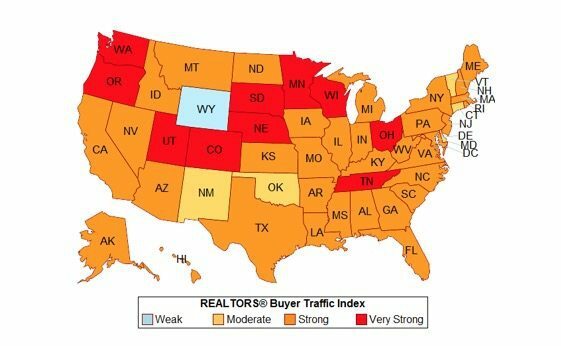 The buyer traffic index shows moderate, strong or very strong buyer demand in every state except Wyoming, where buyer demand is weak. The buyer traffic index for March 2017. “Nationally, employment rose 1.6 percent in February 2017 compared to February 2016,” noted NAR in a blog post. Employment did contract in a few states — “the oil-producing states of Alaska, North Dakota, Wyoming, Kansas, Oklahoma, and Mississippi, as well as in West Virginia,” according to NAR’s blog post. “Respondents reported that demand is strong, but supply is lacking, especially homes that are affordable to buyers,” said NAR in its report. 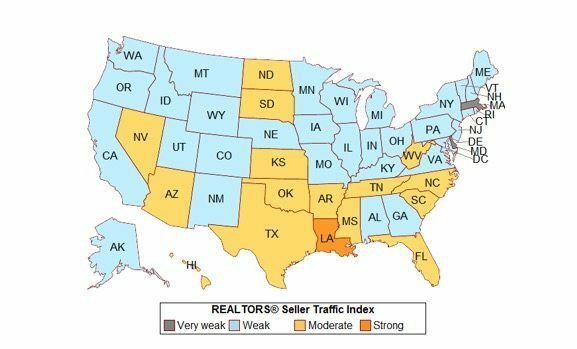 The seller traffic index shows strong seller traffic in Louisiana, and it shows moderate seller traffic in North Dakota, Kansas, Oklahoma, Mississippi and West Virginia — all states in which employment did not grow during March. The seller traffic index for March 2017. There are also fewer new foreclosures, NAR noted, calculating that distressed properties accounted for 6 percent of sales, purchases for investment purposes comprised 15 percent of sales, and cash sales comprised 23 percent of sales. “Amid tight supply, half of properties that sold in March 2017 were on the market for 34 days or less compared to 47 days in March 2016,” NAR noted in its report. So there still aren’t enough affordable homes for all the buyers who want to buy, in short. Haven’t we heard this song before?